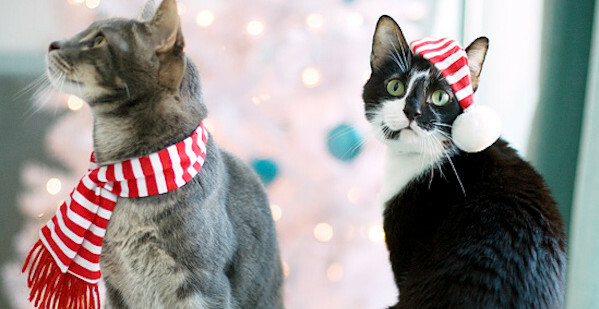 We dress up for the holidays, so why can’t our cats? 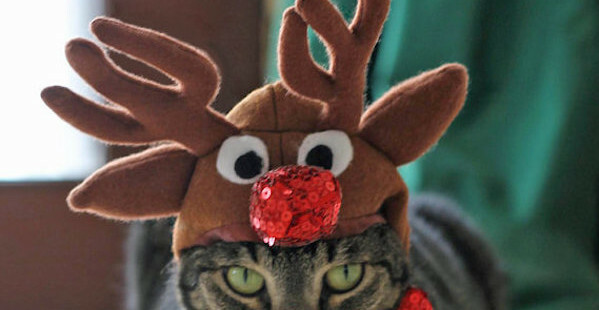 There are several reasons to dress up our cats this holiday season. These include to keep them warm, to show off their personality, and so they can shine during our Christmas celebrations. What cat wouldn’t want to be the center of attention, right? Perhaps the most important reason to dress up your cats this yuletide season is so that they can be part of our festivities. They are part of our family after all. 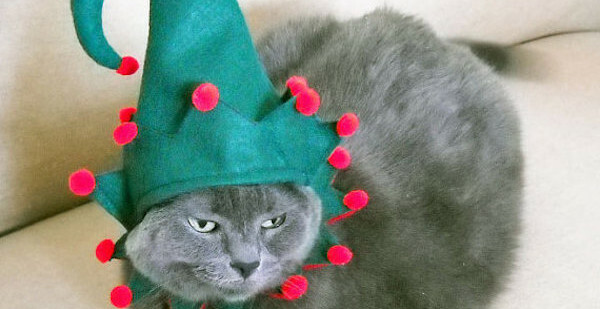 Not all cat lovers think cats love to dress up during the holidays. 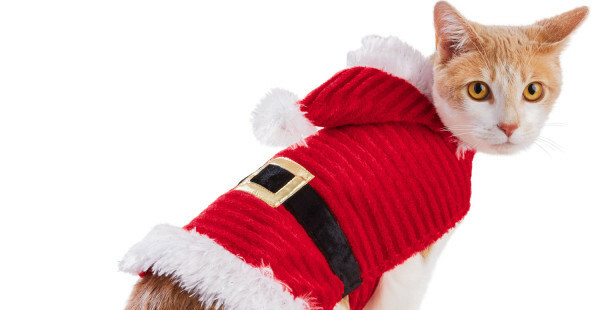 But if you’re part of the 32 percent of cat people who are pro-costume, here are several Christmas cat costume ideas you can try. From the simple to the elaborate, there’s a costume for any type of cat owner and their pet. 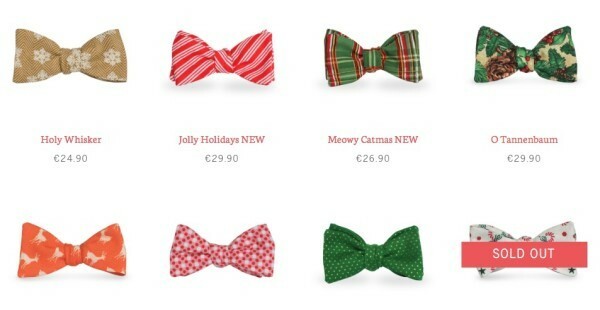 Get your feline member into the festive spirit with a Christmas bow tie, which can be classy, cool, or fun. Here a few you can try. From mistletoes to frosty garlands to pines and other Christmas-themed prints, Cat in Berlin’s Catmas Collection currently has 15 bow ties available. All are handmade from mostly 100 percent cotton fabrics printed in the US, Germany, Italy, Japan, and Scandinavia. The bow ties are fastened with a velcro and come with a vintage style box. A Christmas bandana or scarf is another simple and easy way to get kitty into the festive mood. 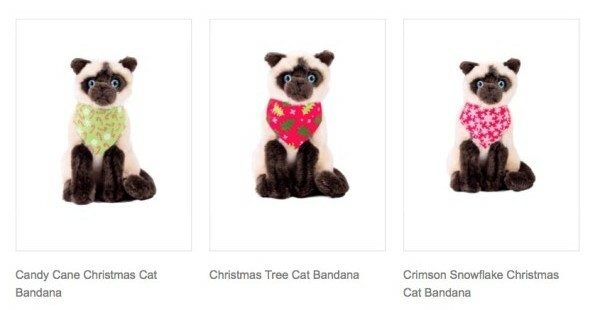 These bandanas are from Precious Pawprints, but you can get similar or other holiday designs from other retailers. A simple change of collar can get your cat into the festivities. 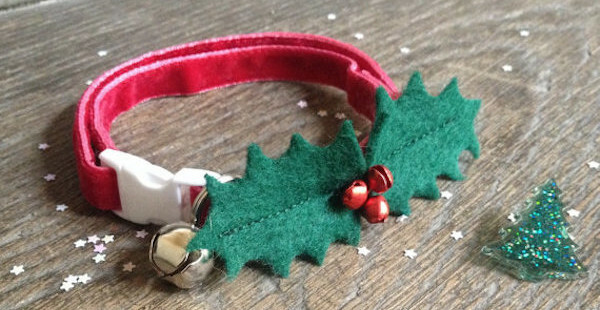 This holly collar comes with bells and is adjustable, too. Here’s another way to spice up the holidays for your cat. A matching hat and scarf outfit not only helps them become a part of your yuletide celebrations, but also keeps them warm. Plus, you can dress up to match your pet’s outfit, too. Are you naughty or nice? Santa cat knows. Of course, Santa needs his little helper. How cute is that? Because Santa needs a reindeer to pull his sleigh on Christmas eve, obviously. Do you dress up your kitty for Christmas? If so, what will your cat wear this holiday season?